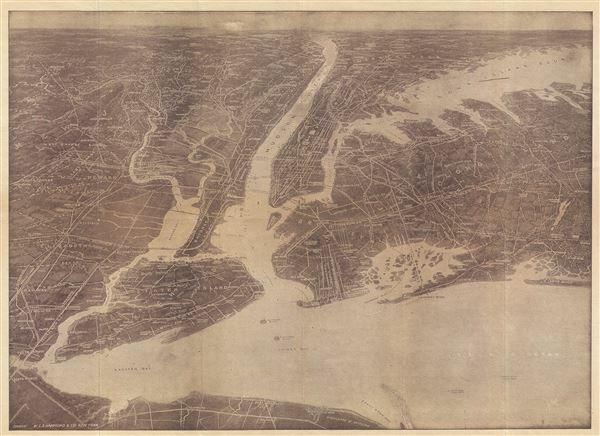 Hammond's Birds Eye View Map of New York City and Vicinity showing Roads, Railroads, Cities and Towns, etc. This is an exceptionally scarce 1925 chromolithograph C. S. Hammond and Company map and view of New York City and vicinity. The view extends from Raritan Bay north to Croton Point and east as far as Huntington, covering all of Manhattan, Brooklyn, Queens, the Bronx, Staten Island, and adjacent parts of New Jersey, Westchester, Connecticut, and Nassau County (Long Island). Individual streets, railroads, parks, rivers, islands, bridges are noted throughout. Major buildings and monuments such as the Statue of Liberty, the Brooklyn Naval Yard, Brooklyn and Manhattan bridges, Penn Station, Grand Central Station and Central Park, among others, are identified. There are at least three variants on this view including the first edition issued in 1909 and another edition issued in 1912. This is the third, monochrome version issued in 1925. All examples are extremely scarce with only three or four examples being cited in institutional collections. Copyright by C. S. Hammond and Company, New York. Caleb Stillson Hammond (1862 - 1929)was the founder of C. S. Hammond & Company, a map making and printing firm based in Brooklyn, New York. Hammond started his career in mapmaking as the head of Rand McNally's offices in New York City, where he began working in 1894. Hammond split with Rand McNally, forming his own printing concern in Brooklyn, New York, in 1900. The firm was subsequently incorporated in 1901 and relocated to Manhattan, and then to Maplewood, New Jersey, near Hammond's family home. Hammond rose to become one of the largest cartographic publishers in the United States, second only to Rand McNally in volume. On his retirement, C. S. Hammond passed the firm to his son, who subsequently passed it to his own son, C. D. Hammond, who sold the company to Langenscheidt Publishers in 1999. The firm has since been folded into Universal Map, an affiliate of Kappa Publishing Group. This archives of the Hammond World Atlas Corporation, an invaluable resource, where donated to the Library of Congress in 2002. New York Public Library, Map Division, Map Div. 08-1547. Rumsey 5434.001 (1909 edition).